For 10 years I’ve seen this be true. I want you to know it for yourself. Join me December 6-15 in Napa Valley for 108 hours of MAGIC! 2 scholarships remaining and 3-12 month payment plans available, e-mail sarah@alchemytours.com to inquire. With gratitude to YOGANONYMOUS, read my full article here! 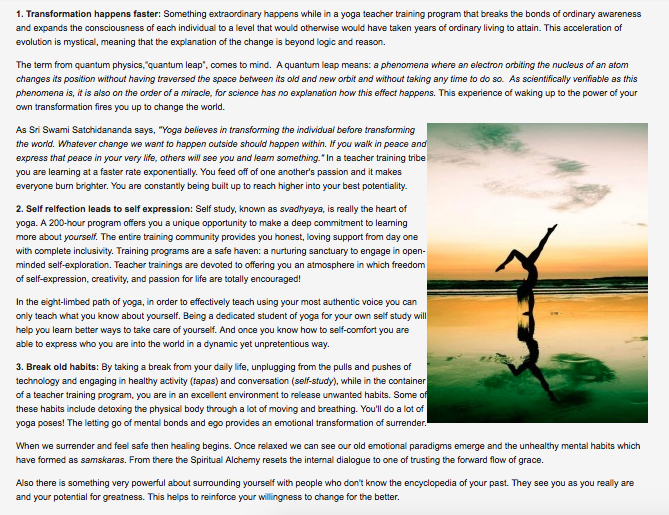 This entry was posted in Alchemy of Yoga, Yoga Teacher Training and tagged 200 Hour Teacher Training, 2015 Yoga Teacher Training, alchemy of yoga, RYT-200, RYT200 Destination Yoga Teacher Training, yoga school, yoga teacher training. Bookmark the permalink. ← New Article on DoYouYoga.com!